an expensive limousine is hit by big truck? Joseph Gordon-Levitt sings the very song – Wrecking Ball – with Miley Cyrus? 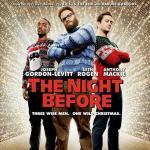 Santa Claus hits in the face (again Joseph Gordon-Levitt)? stoned man vomits in the midst of the church? white wine is poured with tentacles? then you should see this movie not to miss all this. This is situation comedy, when the three friends decide to spend their last Christmas (former druid celebration of the winter solstice, replaced with the advent of Christianity with the new mythology) together. With a budget of USD 25 million, 4 days after its start it has already collected USD 10 million, and it's quite a good beginning, which seeks to ensure that it’ll pay off. This year, 2015, all the movies about Christmas theme obliged to be shown earlier at 1-1.5 months before the named event, as this – is the year of exclusive premiere of Star Wars 7 – just a week before the holiday, scheduled at December 18 and it’ll collect all the credits and all the money. Therefore, nobody plans any film at all at this time (not only holiday one, but literally – any) as this is an idea doomed to failure, as all possible shows will be simply occupied by this galaxial franchise.